There's been a big hoo ha in the UK media this week about Strictly Come Dancing. This TV show is currently the best selling show worldwide, and a huge moneymaker for the BBC. One of the contestants was an ex political journalist John Sergeant. The man can't dance, and by the way I'm the first to admit that I can't either! However, the more the judges said he should go, the more the public voted to keep him in. He resigned from the show, saying even he thought it was going too far, and there was rife speculation that he had been leant on to leave. It's a great show which works so well because you can see the hard, hard work that the celebrities put in, the nerves they feel, and the results which may go either way on live TV. The point I make every year, (and you can search the blog/archives if you don't believe me! ), is that it is amazing what you can achieve by following the simple formula as played out on Strictly Come Dancing - you commit to the goal, you put in lots of effort and work, and although the results can't be guaranteed, it's possible to achieve unthought of results in surprsingly short time. In life you have the advantage that the public cannot take the end result away from you, although of course there are plenty of other obstacles which you may have to get over/around/under/through. You may not have any desire to turn yourself into a dancer, but what *do* you want to turn yourself into? Do you want it enough to commit to it, to work towards it? It's a key element to success/life improvement. On Saturday The Great Gordino Classic curling tournament was held. 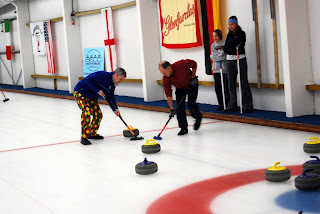 Early on in my curling adventure I was in the winning team that won a lovely trophy. I made the decision that a good way to make sure my name was on a trophy every year would be to start my own trophy. It seems like a wise plan as my team came in 4th place this year! 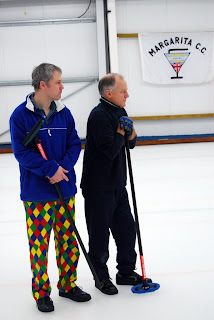 I wore my harlequin trousers in my continuing attempt to get more brightness on the curling ice. Ok, that's it for this week, I'm off to get someone else's name engraved on my trophy. Issue 491 - Are You A 3 Way Adaptor? Well it's been an interesting time for me lately. After the last newsletter, I was determined to get the next one out on time. Not only did I fail to do that, I also failed with the following one, which I had been even *more* determined to get done on time! The reason? Curling. Simple as that. Or in fact not quite so simple. My job at the curling rink has developed, as jobs tend to, and there is always something extra that needs doing. It may be the finer points of maintaing the curling ice, or seeing how far I can get round a U bend, but there have been some long old days. I may not get home until 12.30 at night, with a morning start at 6am. Throw in the 1 hour drive each way, and I never seem to get anything done when I get home bar the essentials. For the nearly 6 years I have been waffling on with this newsletter, I like to write it by just sitting down and writing - not editing too much, which gives a conversational flow that I like. Ok, I may drift off on some peculiar tangents as a result, but it's the way I like to write, I do it for my articles and books, and it works for me. What hasn't worked for me has been that when I realised I was not getting the time to sit and write the issue in 1 sitting, I did not start writing in chunks, but expected to get it done another time - of course I didnt get done another time! This brings up a point I make many times, because it's a good one, and it's about our ability to adapt to change. My ability appears to have been less than I thought it was! At least I have spotted it, worked out what the problem was and come to a solution, so I am writing this issue in chunks. and it *will* have been published on Nov 17th! Change may come to us in many forms, we may ask for it, we may not, but our ability to adapt to it is one of the most important things we can cultivate to make real progress. 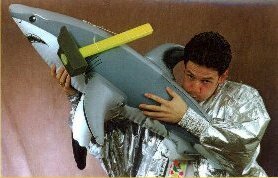 Ok, that's it for this week, I'm off to edit those pics of my curling trousers, which I said I'd show you, and will next time. Not may, but will!